Congrats to Joc Pederson and the LA Dodgers. By beating the host Milwaukee Brewers, 5-1, on Saturday, they return to the Fall Classic, where they will take on Ian Kinsler and the Boston Red Sox beginning Tuesday night at famed Fenway Park. Pederson started in left field but came out for a pinch hitter in the third inning after grounding out in his only at-bat leading off the game. Overall, he had three singles in 13 official plate appearances during the N.L. Championship Series. 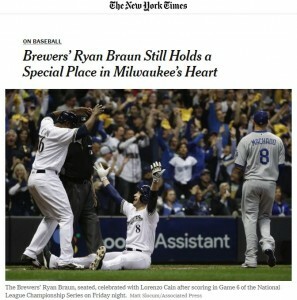 Ryan Braun was 0-for-4 in the deciding game. He had seven hits, including two doubles, in 29 at-bats and drove in four runs during the NLCS. The New York Times ran a nice feature on him on Saturday. By the way, in case no one else mentions it among the hundreds of pre-World Series background stories and fillers, Fenway (opened 1912) and Dodger Stadium (opened 1962) are two of the oldest ballparks in the Majors. Another “fun fact”: the last time these two teams faced off in the World Series was back in 1916, when the Dodgers were known as the Brooklyn Robins (named after their beloved manager Wilbert Robinson). The Sox took the championship that fall, four games to one. Ron Kaplan (@RonKaplanNJ) hosts Kaplan’s Korner, a blog about Jews and sports. He is the author of three books, including The Jewish Olympics: The History of the Maccabiah Games and Hank Greenberg in 1938: Hatred and Home Runs in the Shadow of War.